Please enjoy this performance of “This Little Babe” by Benjamin Britten transcribed for organ solo by S. Andrew Lloyd who is also the artist. St. Mark the Evangelist Catholic Church, San Antonio, is a vibrant Christian community of 5,000 families, located about twenty minutes north of the San Antonio International Airport in a new residential neighborhood on Thousand Oaks Drive. They have a well deserved reputation for superior community outreach, building several Habitat for Humanity houses per year, and operating a traveling meal program for the needy. Under the leadership of The Rev. Monsignor Kevin Ryan, and Parish Administrator Dorothy “Dot” Hamlin, the parish has deftly managed its impressive growth in a relatively short amount of time. 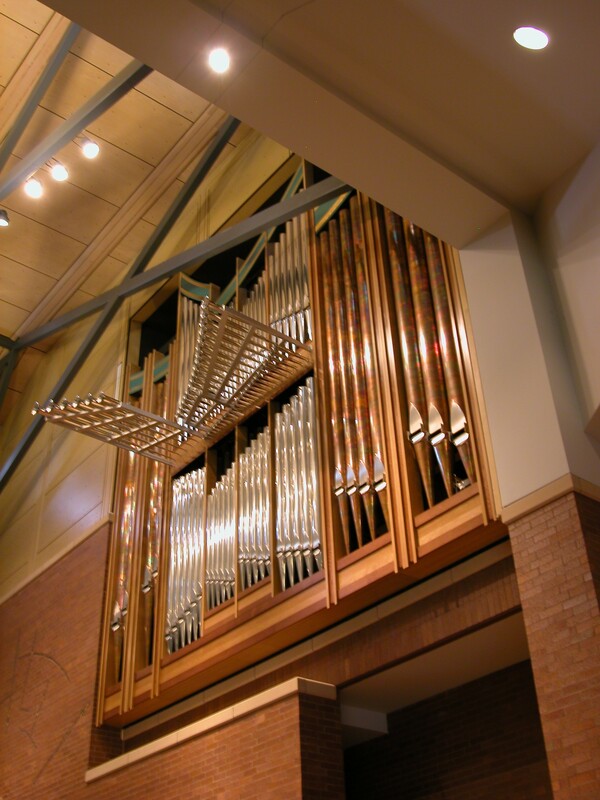 Former Organist and Director of Music & Liturgy Lena Gokelman contacted me nearly twelve years ago to get my ideas for a new pipe organ for the large church building being planned. She and their consultant Fr. 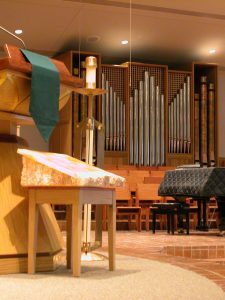 James Brobst, traveled to Illinois to hear and play our instrument at Holy Family Catholic Church in Rockford, and were immediately convinced of the need to have the Buzard Sound at St. Mark’s. 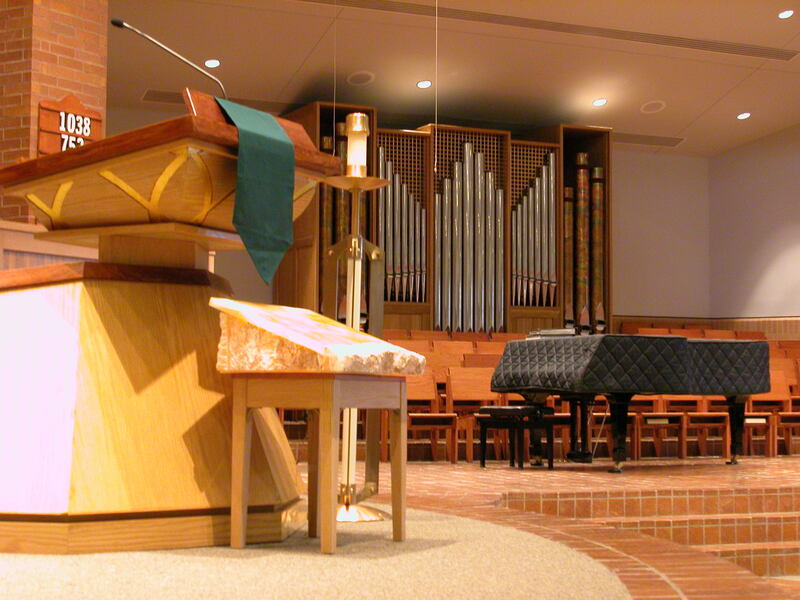 Being a young parish, St. Mark’s had no pipe organ, and the majority of parishioners had never heard one. It was a daunting endeavor to educate the parish to the difference which a pipe organ could make in their Liturgical and musical lives, and then convince them that they needed one! A long-standing parishioner of means was convinced, and through his anonymous generosity, made it happen. The church was designed by prominent area architects Gregory Davis and James Rexrode, and the basic space planned for a pipe organ advised by Houston organbuilder Pieter Visser. The building seats about 1,000 people and is remarkably lively in its acoustical environment. Our new organ was designed to visually compliment the interesting contemporary sculpture of the Christus Rex, incised into and built out from the brick wall at the front of the assembly. The organ itself is raised 18 feet above the floor and sounds along the building’s axis. Sonically it fills the entire room whether playing soft or loud. The woodwork in the façade is solid white oak, stained in two colors and finished to relate to the Church’s other woodworking. Pipes in the façade are made of polished tin and flamed copper. 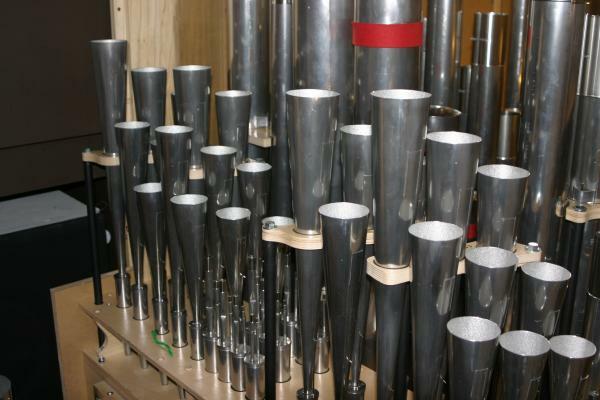 Two sets of horizontal trumpets emphasize the aural excitement which a pipe organ can bring to a solemn Liturgical occasion. 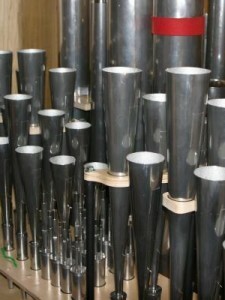 A high pressure Tuba made of polished tin is in the organ’s façade; a polished copper set of lower high pressure Pontifical Trumpets is mounted over the entry doors. Lest you think that valuable resources were squandered on two Chamades, which might have otherwise been used to increase the main organ’s specification, the Chamades were included only after the organ’s chamber space had been completely filled with the necessary and customary stops. The choral singers are located to the right of the building’s axis, in its own “bump-out” seating area. Because the choir is effectively in another acoustical room, and the singers cannot hear the organ clearly, we provided a five stop Choral Organ to accompany them, housed in a small free-standing case which stands behind them. The instrument sports 35 independent stops and 43 ranks of pipes across three manual keyboards and the pedal clavier. As in all Buzard Organs, there is a wealth of tonal variety, even if the instrument is modest in size. At the hand of Tonal Director Brian Davis, all the Diapasons have individual interest; the flutes are liquid in tone and often take their cues from orchestral counterparts; strings impart a warmth and keenness to the palate. The chorus reeds are spectacular, each stop having its own depth and degree of èclat; the plaintive English Oboe is a tremendously effective solo player, but also colors the Swell flues subtly. All metal pipes are made of rich, high tin-content metal of generous thickness, most 70% tin. The organ’s engineering was accomplished by our Charles Eames. 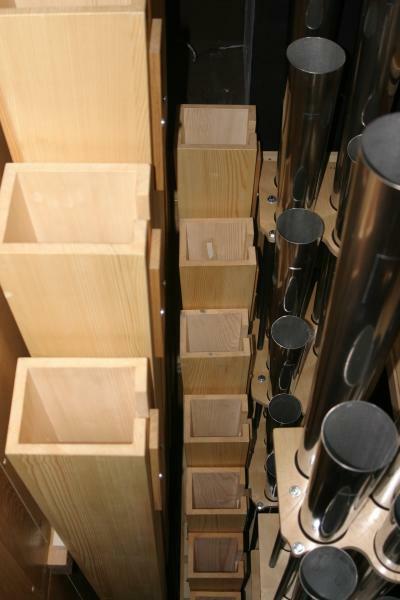 This instrument has the distinction of affording him one of his greatest challenges: designing a pipe organ through which a 14″ steel beam runs across its center! Although a chamber was provided for a future organ when the church was built, neither architects nor contractors thought anything wrong about running a steel beam through its middle! 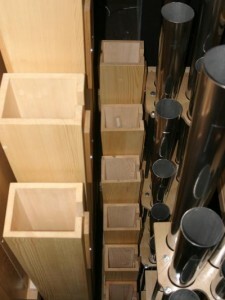 Although the organ occupies a “chamber”, the instrument is still housed within a free-standing case. This allows the sound to effortlessly project into the church, and minimized variables while installing on-site. This also afforded us the opportunity to build a ventilation system which brings conditioned air from the church up to the top of the organ, spilling down naturally, thereby keeping the instrument in tune. The Parish Administrator, “Dot” Hamlin, and Director of Music Dolores Martinez were tremendously hospitable to our installation and voicing crew. They actually competed with each other to see who would cook our dinners! 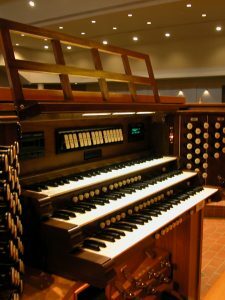 The Parish is “between organists.” So, in order for the parishioners to hear what an organ could do for worship, I played for the three Sundays that I was in San Antonio voicing the organ. The first Sunday, people heard only those few stops which were finished. But by the second and third Sundays, I accompanied the hymns, and played opening and closing voluntaries using the versatility of the entire instrument. 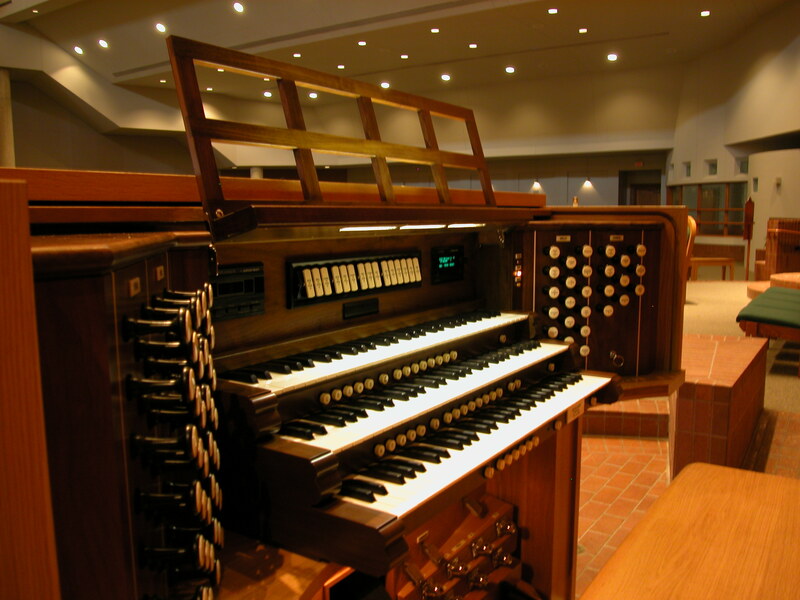 The instrument has been extremely well-received by the parishioners, clergy, and the wider organ community. Organist David Heller dedicated it in Solemn Pontifical Mass followed by a concert on Saturday, November 21st, 2009.